The annual Phoenix monsoons can be exciting – and dangerous. Extending from mid-June through the end of September, monsoon season brings with it torrential rain, dust storms, violent thunderstorms, and high winds that put trees and property at risk. Monsoon damage to trees is usually caused by strong winds, especially if there’s been recent heavy rain. When our clay soils get saturated with rainwater, tree roots are less able to hold a tree firmly in place. This is particularly true for recently-planted trees that haven’t yet developed a large root system. The end result is trees being toppled by monsoon winds as the roots are pulled out of the ground. Storms also cause broken branches and even snapped tree trunks. While you can’t completely eliminate the possibility of storm damage during monsoon season, there are things you can do to protect yourself and minimize the risk. Much of the damage sustained by trees during monsoon storms is preventable if you know what to look for and then take action to remedy the problem. Take a close look at your trees (from the ground – don’t try to climb them!) to see if any of the following problems exist. Each of these issues increases the risk of failure and damage from storms and high wind. If you’re not certain whether or not any of your trees are a safety risk, give us a call and one of our Certified Arborists can do a thorough tree inspection to quickly identify any hazardous situations. Once you’ve identified any issues with your trees, it’s time to take action to remedy the problem. Ideally, this would be done before the monsoons arrive, but even doing the work during monsoon season will be helpful. If a tree has severe problems that cannot by fixed, it’s best to remove the tree. Recently planted trees should be properly staked. Most other issues can be addressed by proper pruning. This involves both corrective pruning (to fix problems like crossing branches, to remove dead, damaged or diseased wood, or to prune back overhanging branches that could damage your house) and crown thinning. Crown thinning reduces the overall weight of the tree canopy and increases airflow through the branches (thus reducing wind resistance) by selectively removing up to 20% of the canopy. This does NOT mean removing a lot of branches from the interior of the tree, leaving plenty of foliage around the outside – that only makes monsoon damage more likely. Instead, heavier growth at the end of branches is thinned out to reduce the load so branches are less likely to snap in high winds. Regular tree maintenance and pruning by a Certified Arborist is the best investment you can make to prevent tree damage during monsoon season, saving you time, money and the aggravation of recovering from monsoon damage. 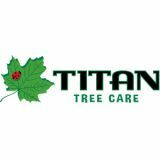 Contact Titan Tree Care today for help!